Hello there stamping friends! 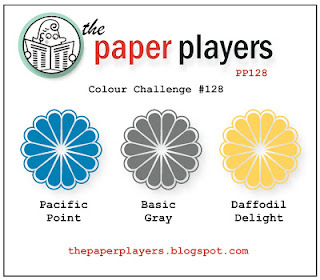 This week at the Paper Players, I am hosting with a fun color challenge. I wanted to base the combo around a color that I don't tend to use very often, Pacific Point. 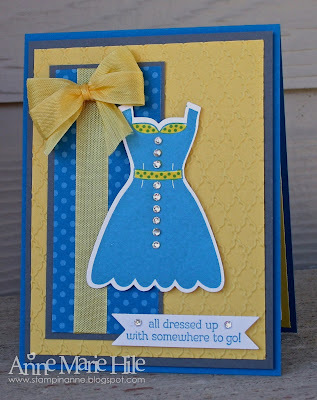 I finally inked up another new stamp set from the Spring catalog: All Dressed Up. This set has coordinating die cuts, too. Love that! This was an easy card to create, not that you could tell by how long it took me to put it together. I couldn't decide on the embossing folder, then whether to use pearls or rhinestones for the buttons, then the ribbon...or no ribbon. Arrrgh! I'm still not 100% sure I love it but it is finished and that's what matters. All of the supplies I finally settled on using are listed at the end of this post. I think these colors can be used for SO many different occasions and the Design Team really rocked this challenge. Stop by and visit them to see what they came up with. Please join us at the Paper Players this week and play along. The challenge is open through Friday, January 18th at Noon (PST). What a pretty dress Anne Marie! Great colors, Anne Marie! This is a fun sunny dress to help warm us all up in the cold of winter! I definitely would never have thought that you hesitated on any of these great details!! 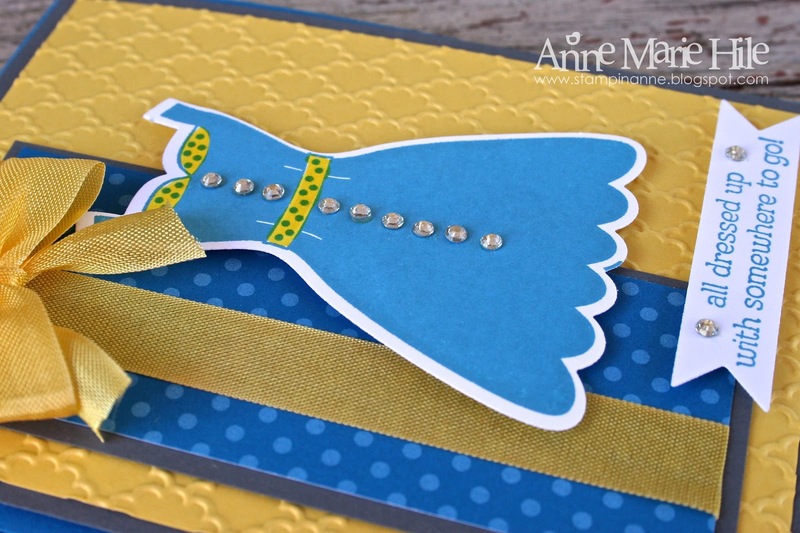 Anne-Marie, I admit I shuddered when I saw this Pacific Point color combo but you are so wise because it is gorgeous! You've made the perfect party frock and I love the rhinestone "buttons"! Thanks for pushing us putside our comfort zone with this beauty! Have a great week, my friend! Such a sweet, pretty dress, Ann Marie. I didn't give this stamp set a second look in the catalog but I love what you've done with it. Ann Marie so cute ! Love the rhinestone buttons and the bow is perfection! Gorgeous. Also ... Love your colors you picked too. AM, great use of the new set and I love the layered sentiment... it might have been a cover up, but it looks great! i love the pops of yellow on the dress and those fabulous rhinestone buttons. Fabulous. Thanks for a great color challenge. Aw! This is so cute...and so Anne Marie! I love it! I am loving the rhinestone buttons! I am glad you chose this as your image for this challenge, as I haven't seen it much out in blogland! I love your rhinestone buttons....a girl can never have too many rhinestones! And I am glad you added the ribbon & bow--perfect! What a cute card, Anne Marie! 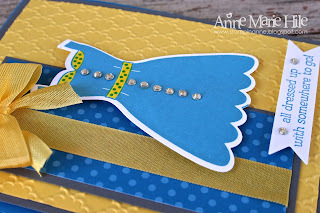 I think the bow is a perfect finishing touch, and I love the clean lines of the card. Thanks for a fun color challenge -- Pacific Point is not a color I pull out very often either. Great colors! 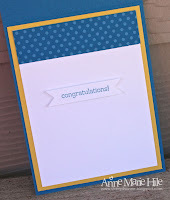 I think you did a wonderful job on this!I hate to admit that this stamp set intimidated me at first, but I have seen so many pretty cards using it! Beautiful Anne Marie! Looks like you are dressed up for a nice summer BBQ! I've popped back over to thank you for your sweet anniversary wishes for me and Mister. That was very nice of you, Anne Marie! I love how you've embraced the blue and yellow! What a pretty dress!